When my family entertains we are always looking for an easy breakfast recipe that will serve a crowd. It's a bonus if it can be done ahead of time so there are no sleepy eyes trying to read a recipe. This strata recipe is a great breakfast that is made the night before so all you have to do is put it in the oven the next morning. It smells so great baking, it will wake everyone up! 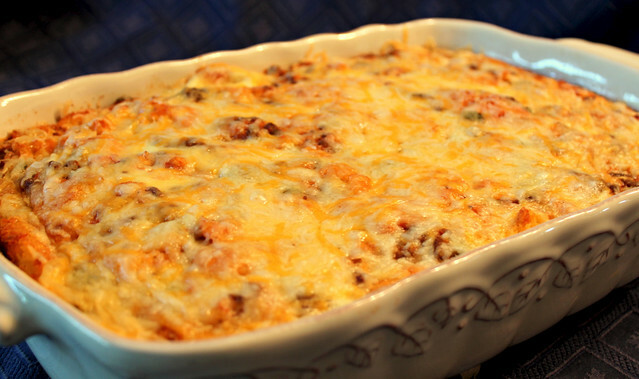 A strata is a layered casserole that usually contains bread, eggs and cheese. This particular recipe uses cornbread which adds a slightly sweet flavor. You could use leftover cornbread, if you have it on hand, or you can quickly make up a boxed version. I used the Krusteaz Fat Free Honey Cornbread mix and it worked really well. It baked up fluffy and light. The Perfect Pairing for this recipe is a combination of toppings like green onions, avocados, cilantro and sour cream. 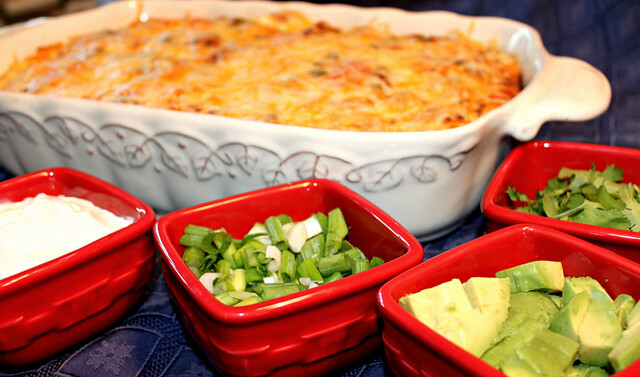 The strata is great on its own but these accompaniments add another layer of fresh flavor. Spray a nonstick skillet with cooking spray and add the turkey sausage. Break up sausage and add the chopped onion. Cook until sausage is cooked through and onions are translucent. Drain off any extra grease and add the salsa and chopped cornbread. Pour mixture into a greased 9x13 pan. Whisk together eggs, milk, seasoned salt, garlic powder and pepper. Pour over the cornbread mixture. Press it down to absorb the egg mixture. Cover in plastic and place in the refrigerator overnight. Preheat the oven to 350 degrees F. Bake strata for 60 – 75 minutes, or until a toothpick comes out clean in the center. Add shredded cheese for the last 15 minutes. Serve with cilantro, avocado, green onions and sour cream. Found you through Tasty Kitchen - love your blog name/idea! I'd love to see the inside of this recipe...guess I'll have to try in so I can see :) Love the pairing with avocado!